Heat closed medium-size contact grill for 5 minutes. Position drip tray to catch drippings. Meanwhile, in large bowl, mix beef, onion, brown sugar, vinegar, Worcestershire sauce and 1/4 cup of the ketchup. Shape mixture into 4 patties, about 1/2 inch thick. When grill is heated, place patties on grill. Close grill; cook 4 to 7 minutes or until thoroughly cooked and no longer pink in center. 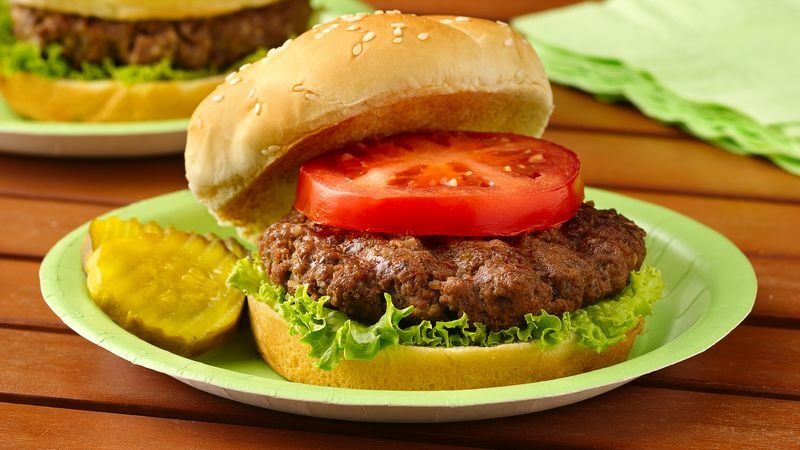 Serve burgers in buns with lettuce, tomato and remaining ketchup. For toasted buns, remove cooked burgers from grill; wipe grill plates with paper towel. Place 2 buns, cut sides down, on grill. Close grill; cook 1 minute. Repeat with remaining buns.